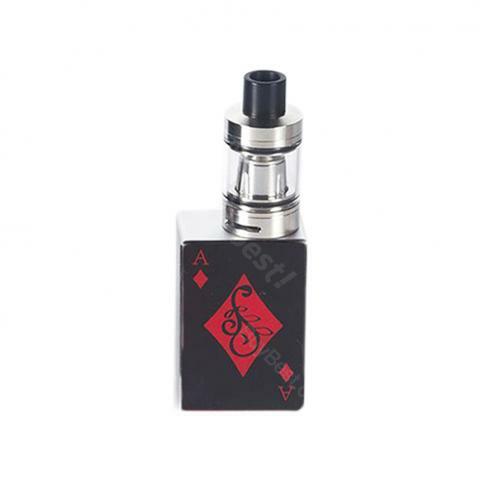 The Avidartisan Gamblers Kit consists of a 60W Gamblers TC box MOD and a 2ml Gamblers tank with sub ohm coils. Various patterns for your selection. Inspired by the play cards, the Avidartisan Gamblers is a compact vaping device which combines a 60W Gamblers box MOD and a 2ml Gamblers Tank in a kit. The Gamblers MOD comes with a built-in 1600mAh battery and supports temperature control for Ni/Ti/SS wires. The included Gamblers Tank has 0.3ohm and 0.5ohm coils, which matches perfectly with the Gamblers MOD. You can carry and hold the Gamblers 60W kit easily for its tiny size. Available in four acctractive patterns with black and silver colors. • You also can buy the replacement Gamblers 60W MOD. Für den Preis ist das Set echt gut. Das Design der E-Zigaretten ist sehr schön. Leichte Handhabe, gute Rauchentwicklung. Avidartisan ist wirklich gut. Perfect! Just what I was looking for. Very pleased.